SEO (search engine optimization) remains a critical part of your comprehensive inbound marketing strategy. SEO may also be the most technical aspect of your online marketing efforts. 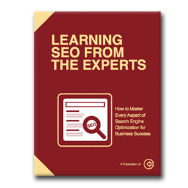 We have created this very detailed guide that will show you how the experts approach and implement a high quality, productive SEO (search engine optimization) strategy as a part of their overall marketing blueprint. How to create an effective linking campaign. What specific elements the major search engines are looking for. A well-written SEO guide will be very useful and productive for those who need to understand what SEO is and how to be sure their website is as compliant as possible. Your webite, SEO, conversion process, sales process, analytics, reporting and modifications are constantly evolving and demands constant attention. We encourage you to request a discussion with us to help define the best possible solution and application to meet these demands. Just complete the form on the right side of this page and we will send you an email that contains a link to this powerful and comprehensive SEO application guide.